Kashmani Salukis - Kashmani uppfödning av salukis och shetland sheepdogs (shelties). Karin Hedberg. FCI internationell exteriördomare hundutställningar. Salukivalpar födda 12 april 2018! Ch Salgrey'S Dream Khan in the ring, at Öland, September 2017. Ch Kirman Eudora BOB CAC CACIB Group 1 in Kielce, Poland, November 2017, thereby qualifying for her International Show Champion title. 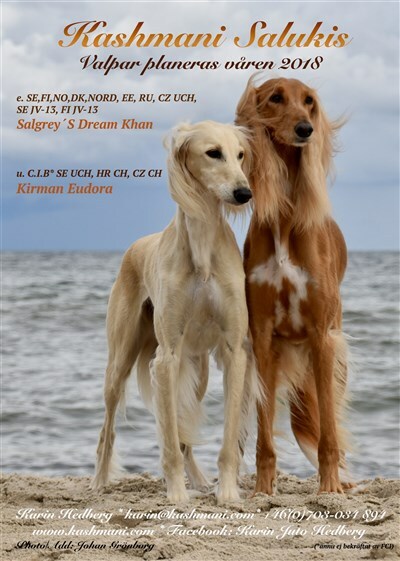 Ch Kirman Eudora at a show 2014. Photo Saori Wohlin. Ch Kirman Eudora Sighthound Club Winner 2014 at Eurosighthound Show. Photo: Dan G W Hansson.